Any of you who have used this stuff will readily agree: It is awesome. I worked on high temp testing of directional drilling tools and we used this stuff EVERYWHERE. Wonderful wonderful stuff. What about low temperatures? Will this stuff stay sticky below freezing? The datasheet only seems to mention the maximum of its rated range. So to be clear, good electrical insulator but good heat conductor? And wouldn't this be useful double-sided for heatsinks...? Yeah not a good heat conductor ... very much an insulator. I use this stuff extensively in my workplace. Its the equivalent of duct tape in how its used in semiconductor. We put this stuff through metal sputtering tools (high temperature, plasma, and bakes), high vacuum, HF and sulfuric acid etching, it blocks photo litho exposures but is still see through enough to align to something underneath if need be, blocks off reactive ion etching, and is otherwise a great electrical insulator. You can freeze it, its adhesive is not water based (its silicone based) and doesn't require preservation at low temperatures. We even use it for pull strength testing for ball mount pads sometimes. Adhesive cleans right off with IPA or acetone. A post below mentioned its use in High vacuum systems, and yes is true that it will give off some gases from the adhesive. A miniscule amount and perfectly acceptable in most situations. SparkFun offers this for use with heatsinks, it's a better heat conductor and it's double-sided. Its also good for holding temperature probes when doing thermal profiling of ovens. Thermal profiling is important when working with expensive and temperature sensitive parts. It is both a good electrical insulator and a good heat insulator. I remember when this stuff used to be $5 a foot. At one place I worked we had to record the length we took from inventory. I was very glad when the price dropped. Is this kapton tape? It looks like it. Makes a great solder mask for surface mount IC's that have long pads. To anyone who's still interested, I just bought mine and it had a tag on it that seems to say Kapton. Here's a photo. 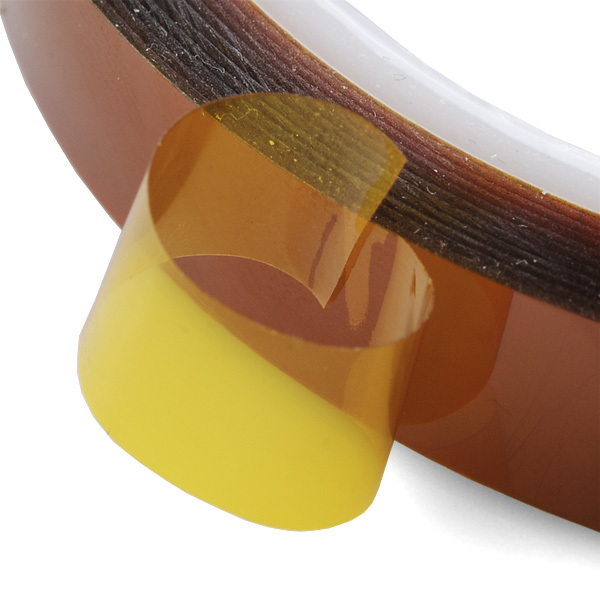 Its appearance and make appears to be similar to that of Kapton tape, but the adhesive may not be the same. 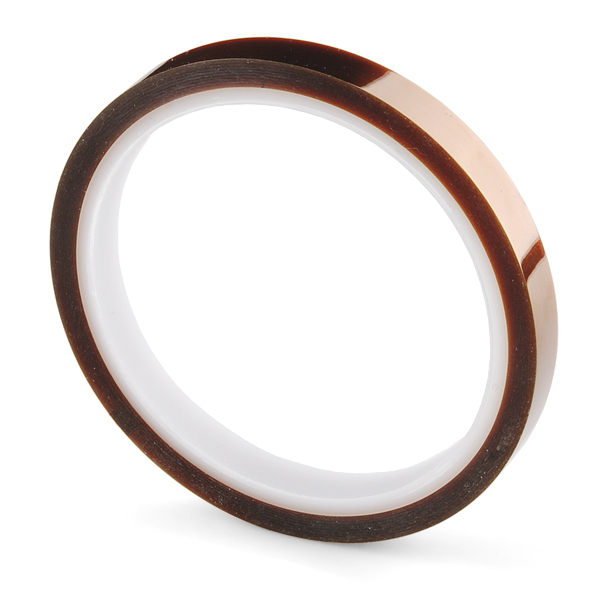 Kapton is a brand of polyimide tape. So yes, basically the same stuff, but technically no because it's an off-brand. This stuff is also the duct tape of 3d printers. I've got bits of it all over my Makerbot, and it's one of the best materials to make a heated build surface to keep prints from breaking loose before they're finished. You'll probably want a wider roll for that purpose, though. It says Kanton on it !